Available in 250 mL and 500 mL sizes. Are you tired of cleaning up agarose messes in your microwave oven? Are you afraid of burning your hands with hot liquids? Have you heard those stories of microwave ovens blowing up because people had forgotten to loosen the cap of a bottle? 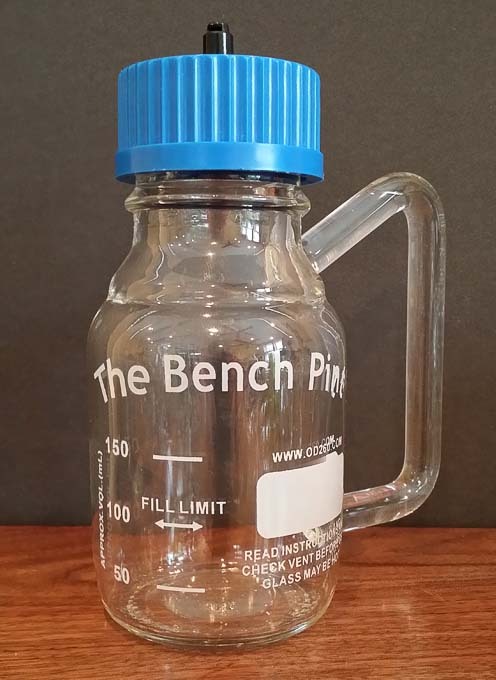 OD260 Inc brings the solution to you: the Bench Pint. Ideal for preparing agarose for electrophoresis or media. Decreases the melting time of agarose solutions. Handle fused to the bottle, which reduces the need for hand protection. Directional pressure release vent that directs hot gasses away from the user. Reduces boil-overs, even when mixing. Reduces evaporation and contamination of your media during heating or long-term storage. Available in 250-mL and 500-mL sizes. Available with a blue, green, grey, orange, purple, or yellow cap. Fits in almost every microwave oven. Bench Pints are guaranteed against manufacturing defects (30) days from the original date of purchase. Dated proof of purchase from OD260 Inc or an authorized OD260 Inc reseller will be required for all warranty claims. This limited warranty extends only to products purchased from OD260 Inc or an OD260 Inc Authorized Reseller. In the event of defects during this period OD260 Inc at its option will replace the defective part or product with a comparable part or product. Any repaired product will be warranted for thirty (30) days. OD260 Inc reserves the right to determine what is considered a manufacturing defect. the product has been subjected to abnormal physical stress, dropping, misuse, mishandling, negligence, accident, fire or other external causes. the product was obtained from unauthorized source or was used commercially. OD260 Inc is not responsible for shipping charges associated with warranty returns. OD260 Inc assumes no liability for any accident, injury, death or any loss or claim related to or resulting from the use of OD260 Inc products. If you did not purchase the Bench Pint directly from OD260 Inc, please contact your Authorized Reseller or Distributor. If you purchased the Bench Pint directly from OD260 Inc, please contact our Customer Service Department at info@od260.com. We will respond within 24 hours. Our Customer Service Department will make all attempts to rectify your problems. If we are unable to resolve the issues, we will ask you to send in the product(s) for further review / assessment. In order to send in your product(s) for further review, you must first obtain a RETURN AUTHORIZATION NUMBER (RA#). Once you have received the RA#, as well as our return address, kindly return the product(s) with a copy of your original receipt and a brief explanation of the nature of the problem(s). Once our team receives your product(s), we will first determine if the product(s) are experiencing issues because of a true manufacturing defect or owner abuse/neglect. If the product(s) shows true manufacturing defect, we will either repair or replace the product(s). Please be aware not to attempt repair yourself, as this will void the warranty. Shipments without RA#, original product packaging and receipt will not be accepted, and returned back to sender without review.